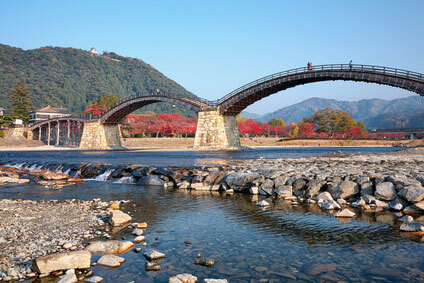 The old castle town of Iwakuni, 40 km south of Hiroshima, is home to one of Japan's most famous traditional bridges, the Kintai-kyō, as well as well-preserved samurai quarters. It is also the location of one of the two US Marines bases on the Japanese mainland. The Kintai-kyō, or "Brocade Sash Bridge" in English, is what everybody comes to see in Iwakuni. The 210-metre long bridge was originally built in 1673 under daimyo Kikkawa Hiroyoshi, without using a single nail ! It was swept away by floods caused by Typhoon Kezia in 1950, and was almost identically reconstructed in 1953. Note that there is a ￥300 charge to cross the bridge (return). 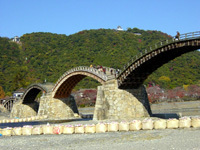 The Kintai-kyō's particularity are its five steep arches, typical of Edo era bridges. 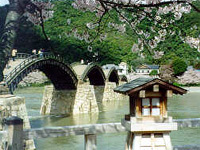 In old times, only samurai were allowed to use the bridge, leaving other people to cross the river by boat. The old samurai houses have been integrated into Kikko-kōen Park, 100m north of Kintai-kyō. The adjacent Iwakuni Historical Museum (￥500) has a good collection of samurai armours and weaponry, more likely to interest aficionados than common folk though. A ride up the cable car (￥540 return) will lead you to a 1960 reconstruction of Iwakuni castle on top of Mount Shiroyama. 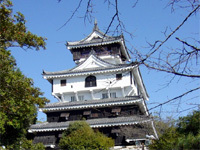 The castle was ordered by Kikkawa Hiroie and took five years to erect. It was completed in 1608, only to be dismantled in 1615 and move it next to the river on order of the shōgun. Iwakuni is about 35-40 minutes away from Hiroshima (￥745) on the JR Sanyo main line. Apart from the shinkansen, there are almost only local trains between Iwakuni and Yamaguchi (2h, ￥1,650). Shinkansen trains use the Shin-Iwakuni Station, while other trains stop at Iwakuni Station. Each station is about 5km from the Kintai-kyo Bridge in opposite directions. There are numerous buses from Iwakuni Station to the Kintai-kyo Bridge (15-20min, ￥240). You can buy a return ticket that includes the entrance to the bridge for ￥650 (instead of ￥780).